The HP 50g’s back shell is textured to provide a better and more secure hand grip. Easy on the eye with dark black body of the HP 50g, and white, orange and yellow for the function shift keys. HP 50g has the full HP Equation Library found in the earlier 48Gx Series, with over 315 equations to solve mathematics and science problems. Serial connection as well as the IrDA and USB ports on the new HP 50g, and cables are included. HP 50g has a new generation of keyboard, which has been redesigned for better feel and firmer entry. When the HP50g is connected to a PC via USB cable, it can draw power from the PC. This feature can extends the battery life on the unit. 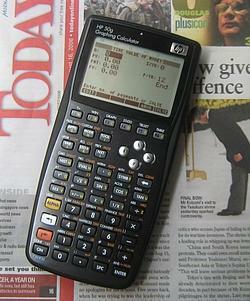 Click here for a list of Authorised HP Calculator Resellers in Singapore.